Sunday morning, a 6.5 earthquake shook Italy, which was how our players started their day. I suppose you could claim that’s why they were so shaky against the lower table Pescara, but those players also started their day with the quake. In a match where Pescara dominated for large portions of the match, and they had two goals called off for offside, a neutral observer might have a hard time choosing which team would finish the day in 3rd on the table and which one would remain in 17th. But three points is three points. And even if it was very shaky and not enjoyable to watch, we did get the win in the end. The tactics may still be missing, the quality invisible, but the result was a win. For the fourth straight match at home. So we’re totally riding the mentality boat, even if all we could produce was a shaky win. In the first half I regretted not staying in bed. Pescara pinned us back immediately and we took some shots. There was a yellow for Brugman, then one for Abate. Then Doveri blew the whistle for halftime. If you haven’t seen the match yet, read this, and still watch the first half, you are a masochist. Find something else to do with your 45 minutes. Anything. I certainly wish I had. I also question why we had to change coaches because of “ugly football” if we are still playing ugly football. This mentality has been built on the foundation that was built last season, so couldn’t we have saved ourselves some money and hassle? Whatever. The second half was when all of the action happened, though. Milan were awarded a free kick and Bonaventura took it in the 49th. He sent it under the wall, who jumped perfectly, a trick he remembered from Honda, who did that this week in training. 1-0 Milan. In his moment of celebration, though, he ran to the camera and screamed into it, dedicating the goal to the victims of today’s quake. That one is all Milan class. "Hey, let's do that trick Honda did in training this week"
The half was fiercely fought, and there were chances for both sides. Including the two Pescara goals called offside and Niang and Bacca hitting the posts at least once each. 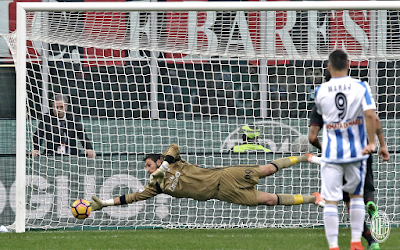 Many of Milan’s 18 shots were Robinhoed™ into the cheap seats, but we actually had nine shots on target, keeping Bizzarri very busy. Of course Pescara’s 14 shots with six on goal also kept our defense and Donnarumma busy. 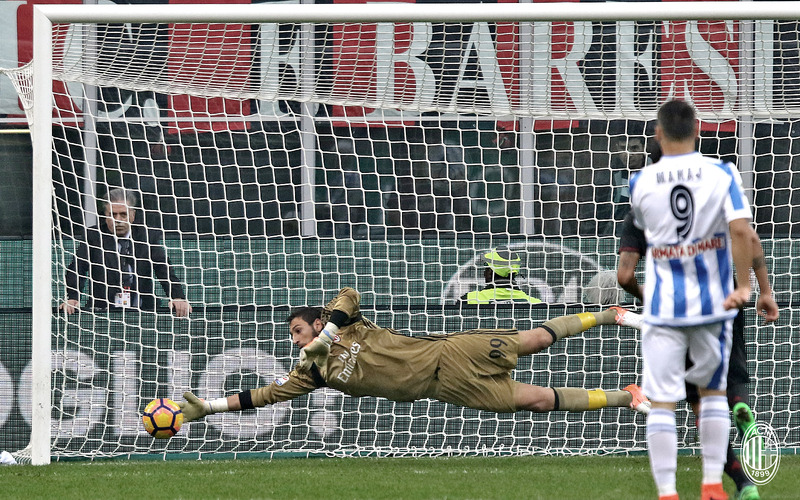 But in the end, Donnarumma would claim his fifth clean sheet of the season, more than any other keeper in Europe, according to @Squawka. Gomez was fierce, a little too much so at times, and showed why he is second to Paletta, but is still a contender for that starting spot. Sosa got the start, but disappointed, maybe just to prove that he should not have started last week, either, despite many fans claiming that. 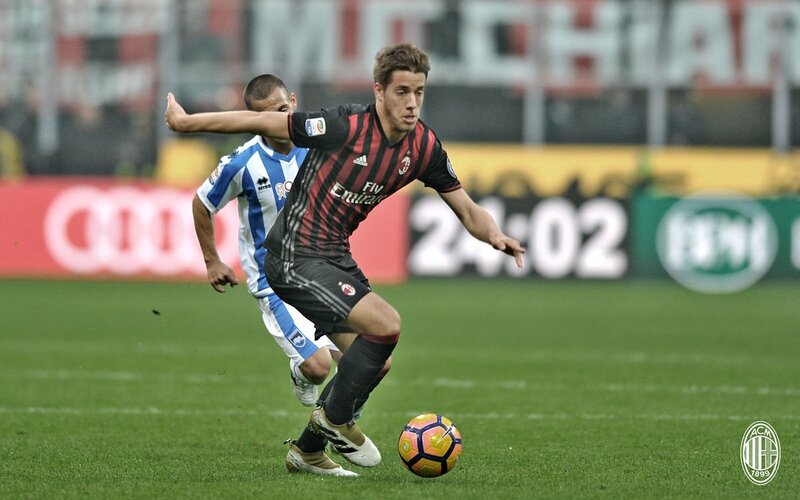 Pasalic got his debut finally, and did well enough, although also quite shaky at times and his shot was wide. If you were trying to choose a MOTM, you wold look at Bonaventura, who obviously scored, but was pretty solid. You would be crazy to overlook Suso, who also had a phenomenal match despite not getting on the goal or assist columns. And of course the always golden Donnarumma. There were also some interesting things happening for Pescara. Cristante, once a Milan youth prospect who was beloved by fans, left Milan in pursuit of playing time in Portugal. Not finding it there, he came back to Serie A on loan to Palermo, and now plays for Pescara. But he didn’t even start. He actually came on for ex-Milan player Aquilani. Both of them seemed determined to score in their former stadium, or at least get the assist. 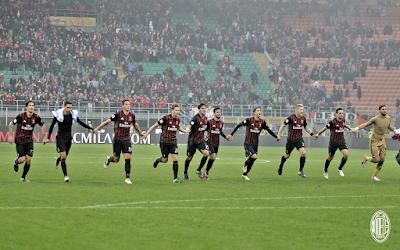 But thankfully for Milan, they left empty-handed. Oddo, our former player who is now in charge of i Delfini, left empty-handed when it came to points, but not when it came to compliments and respect. His Pescara played very well and could have very easily taken all three points from Serie A’s new darling young team in our own house. 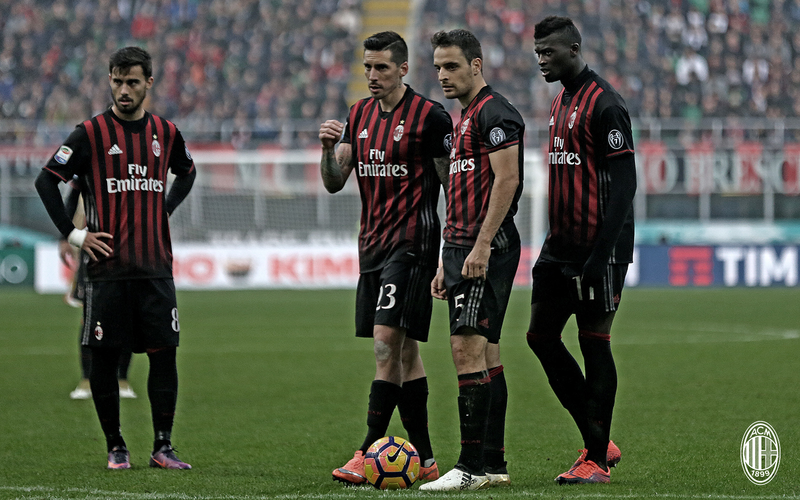 We may be stronger mentally, but Bacca was disrespectful to Montella again when he was subbed off. And he also didn’t celebrate with the team and fans at the end. So stronger mentally, but still undisciplined. With some individual brilliance, luck and that growing mentality, though, we are higher than we deserve to be on the table. If we can continue, not let the success go to our heads (like it may have a little bit away to Genoa,) then we may eventually even play better, too. But don’t be fooled by our points or position on the table. Milan are still not on solid ground when it comes to consistency of play or tactics. But for now we can still celebrate, even if it was a very shaky win. This post inspired by the fortitude of the victims of yet another earthquake in Italy – from my earthquake land to yours – Forza Italia!